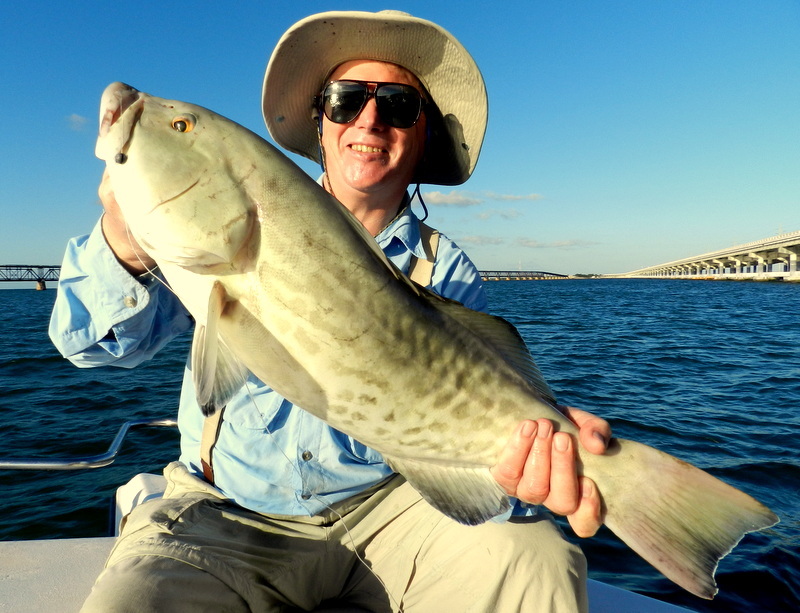 Not sure how this crew got in touch with the weather gods but this had to be one of the best weeks we have had for a long time as I like to say all my now, after doing fishing holidays in the Florida Keys for over 10 years, near 300 marks are open for business . 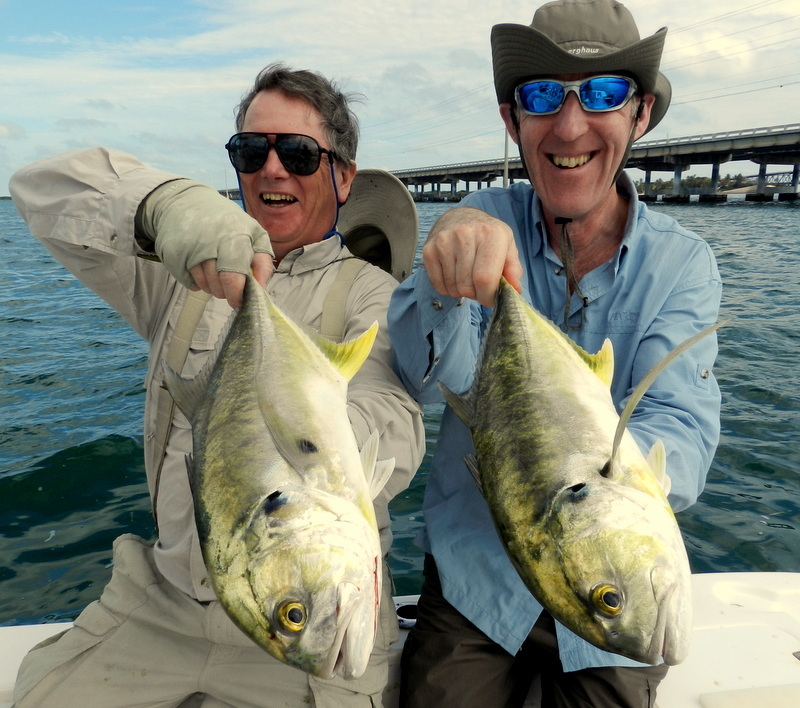 So a plan for an early start on the tuna grounds was put into action and maybe a few dorado on the way back. Strange the sea on the way out in the dark was glass but an annoying swell so down to 20 mph which with 26 miles to do not fun. We were the second boat there and with no birds feeding always means tuna are down and with a perfect 3.5 mph current jigs on the way down straight away fish on. 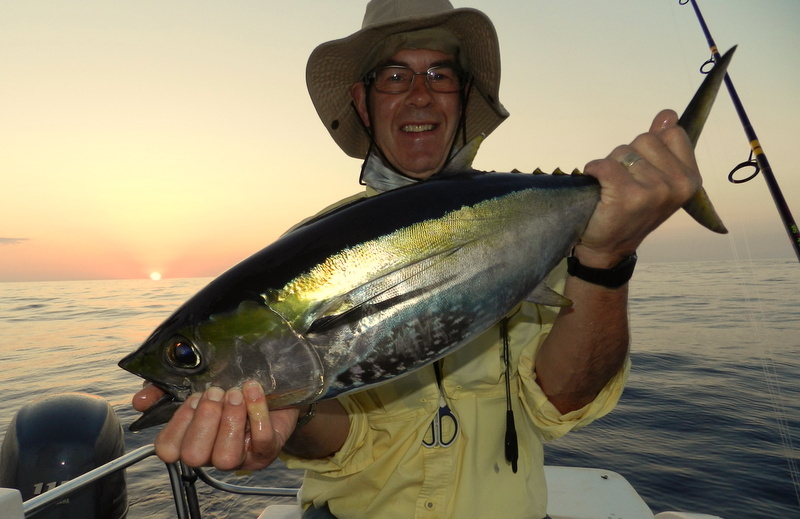 We even had fresh sushi as the sun came up and I managed to get the prefect picture a stunning blackfin for Steve with the sunrise in the back ground. For the first time in months no shark maybe there were so many tuna they had their fill as well, no dorado on the way back it has been a slow start for them this year Dave managed to jump one on a weed line but it threw the hook. Rest of the week was spent in the bay where the wrecks have been on fire and I just seem to be adding more marks all the time some times it is hard to know where to go. 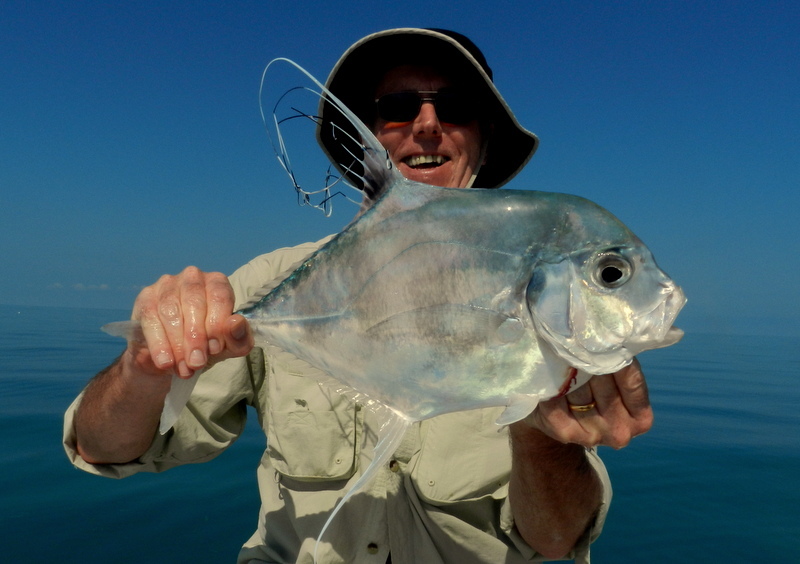 Fish that stand out a cracking african pompano for Graham and a very annoying stingray for Steve this near 100 lb fish more than once did the trick of bedding down in the sand but the old trick of pinging on the tight line soon gets them back on the move. 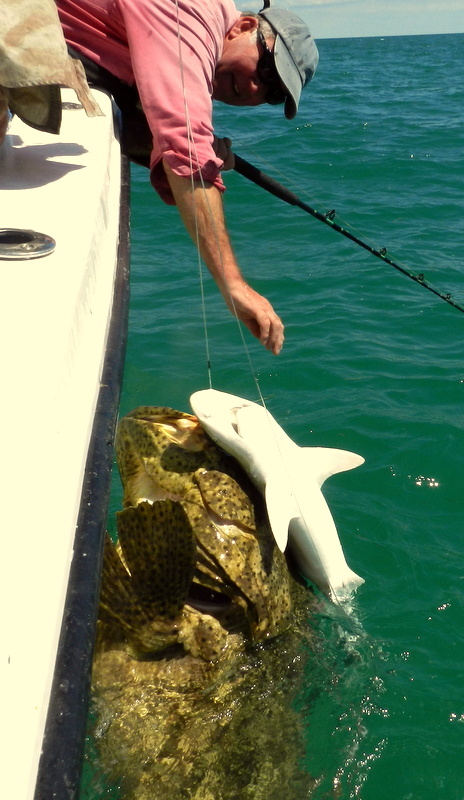 Maybe for me the fish of the week was a near 400 lb grouper taken on the medium shark rod close to the boat and amazing fight and well done the LG Realse reel. So at the last breakfast high fives all round for yet an other stunning trip and the boys booked their 11th and 12 th trips cool or what. Sorry about the lack of blogs but as my Bromley boys get older they just seem to fish harder and this week we have had videos and pics all over the place so as their 10 th trip winds down at last a chance to blog on yet an other epic week. 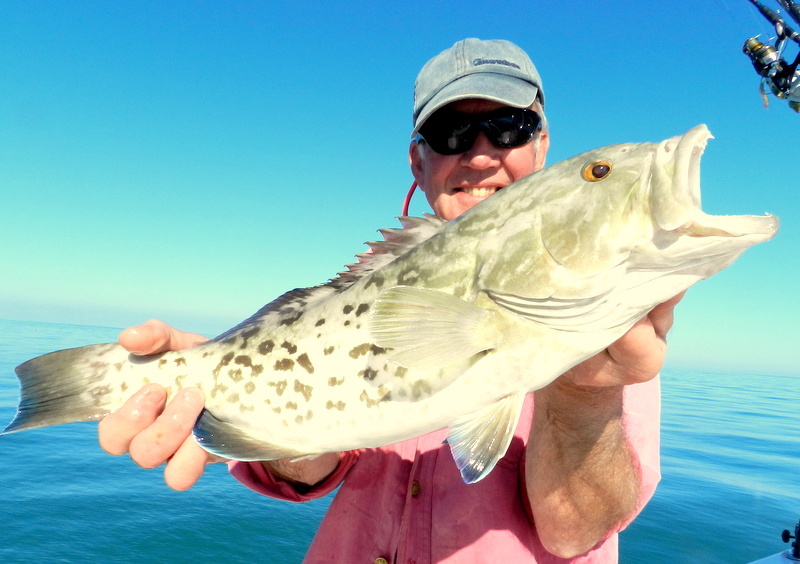 Graham , Dave, John and Steve have had some seriously big fish this week and for once the weather gods have smiled big time this week with some of the flattest seas I have seen for a long time and hot, well one day even the skip had to swim round the boat to cool off. 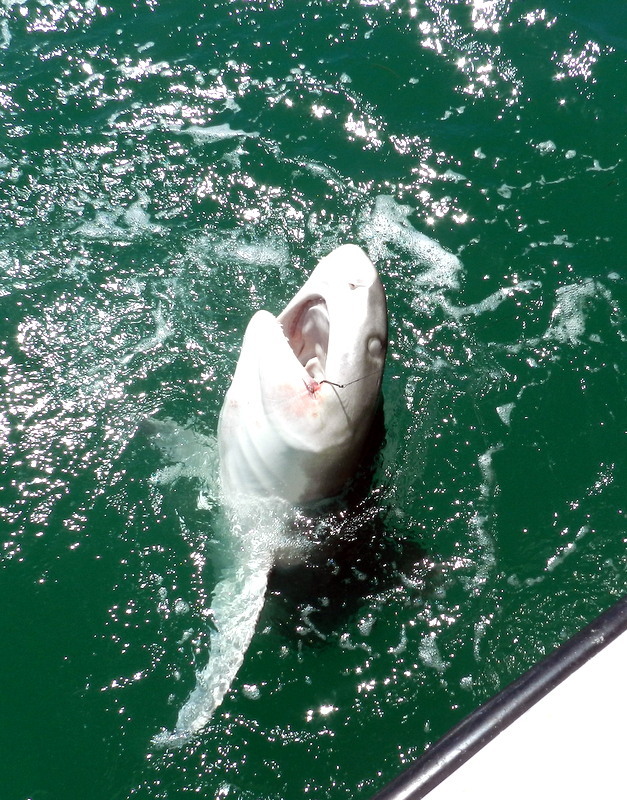 The cuda wreck in the bay was on fire with the fattest bull shark I think I have ever seen, the take was as normal but after doing this for many years I just know when it is a case off throw the pick before the angler runs out of line and follow the fish. I have to say John yet again did a sterling job and this was only ever going to end one way fish to the boat well done John and what a fish with my 100 lb dead lift I could not even get the head out so fish near or over 500 lb stunning. 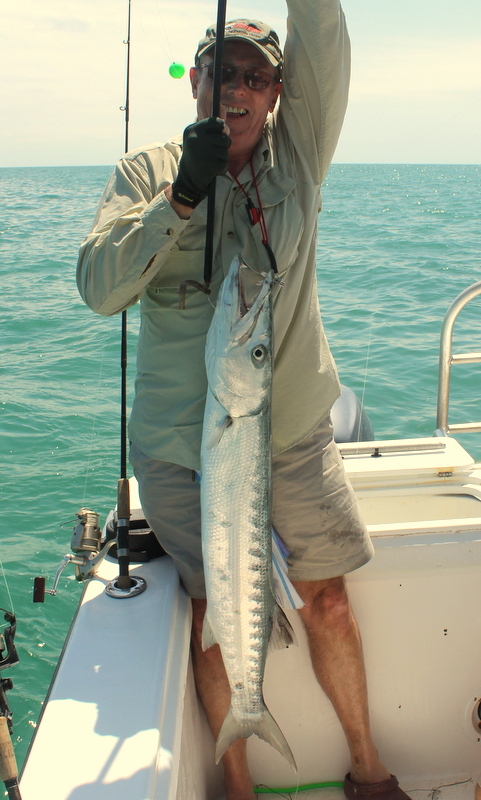 It took some doing but Graham managed a barracuda it can be frustrating with some times over 20 cuda slowly swimming round the boat and chasing the lure but turning away at the last moment. 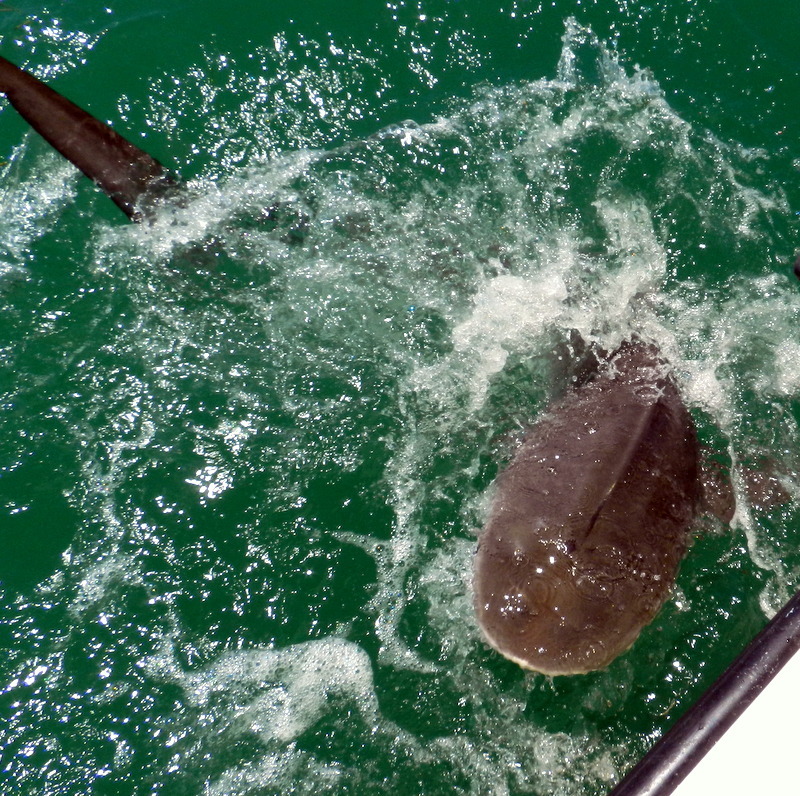 One day on the same wreck the jacks were ever where and to see a shoal run down and then take a popper just awesome with the jacks were a lot of black tip shark to about 100 lb and yes they were taking the poppers as well a lot ended in tears but we got one back to the boat. If you are a lure fisherman let me tell you a 100lb shark in 10 ft of water on a light rod and a popper there is nothing that even comes close. 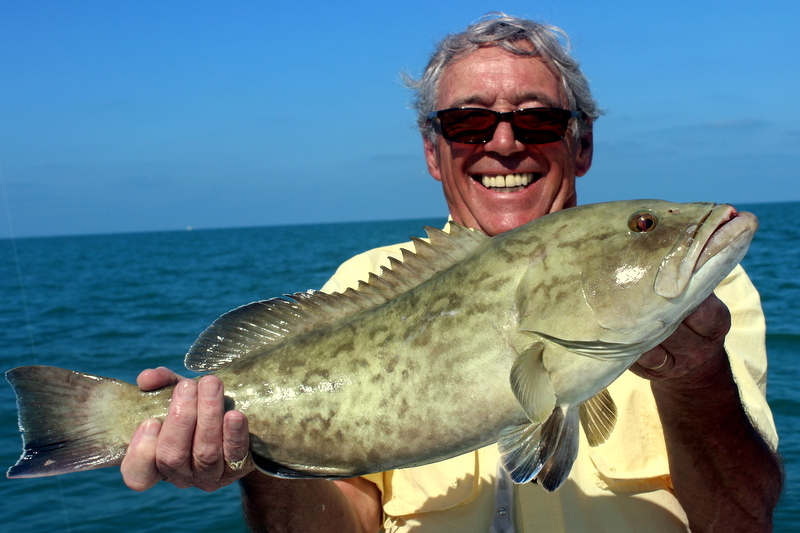 I have to thank Rodney Rigby for all the stunning videos he took on his last trip out here in the Florida Keys, at times it was like having your own personal film crew on the boat. On the last day of his trip we ended up with a video of a life time it all started as a fun day on a wreck some 20 miles out in Florida Bay when the shark rod went off it was George’s turn but this puppy was not for stopping so with over 300 yds out time to throw the pick and chase this sucker down. 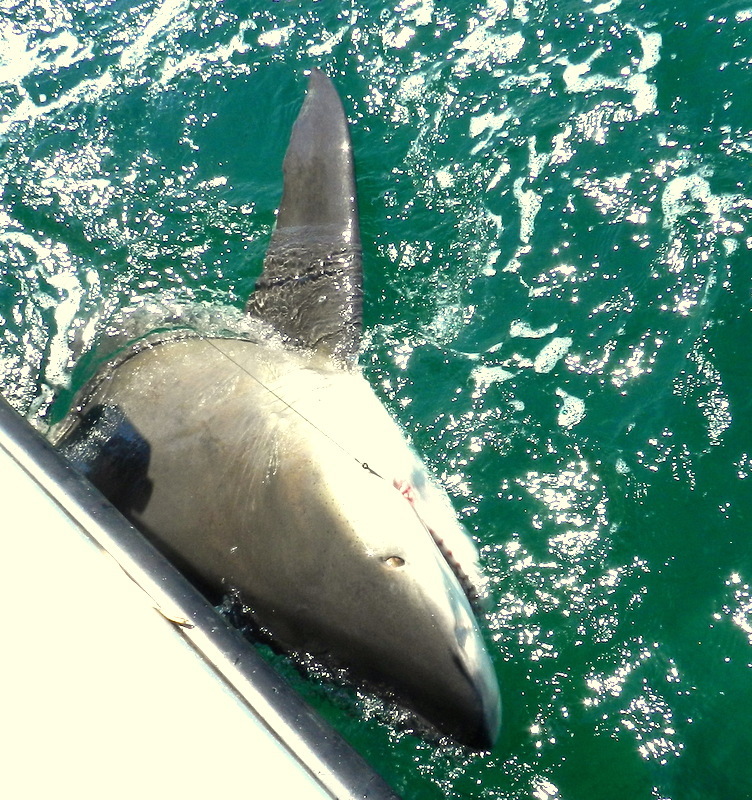 This fight for a shark was turning out to be a very strange one the fish was big and I mean big but it just kept going never coming up and every one on board just wanted a look. At last at well over an hour and many miles from hook up we all got a look a huge lemon well over 300 lb and very, very unhappy. 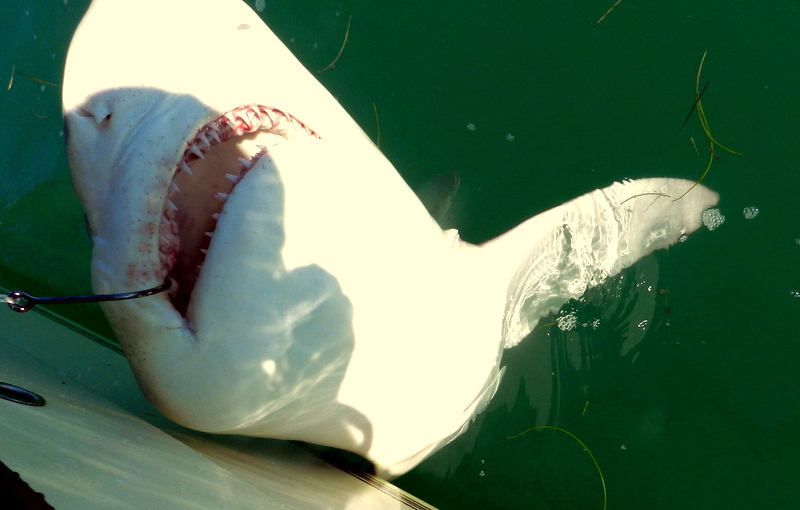 Over the ten years of doing fishing holidays in the Florida Keys I have caught many many lemon shark but this one was behaving very strange even for a lemon talk about bad attitude more than once as you can see on the video massive bites at the boat. I even have the teeth marks in the gell coat one thing I think I have right in all my years over here is knowing when enough is enough so before it did to much damage the boat or its self the leader was cut. If you look or freeze the last few frames you will see just how close Rodney was to losing his Go Pro but well done and thanks again. Comments Off on Shark attack ! I think I work pretty hard my cuts and bruises say so but often I get emails that make it worth it have a look at the on I have just had from Bob Chambers the guy who has just had his first trip with me. expertise had the best time ever. looking for , what a skipper! Do yourself a favour. 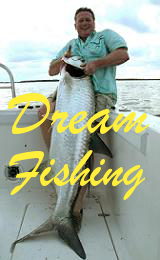 Check out fishing the dream. 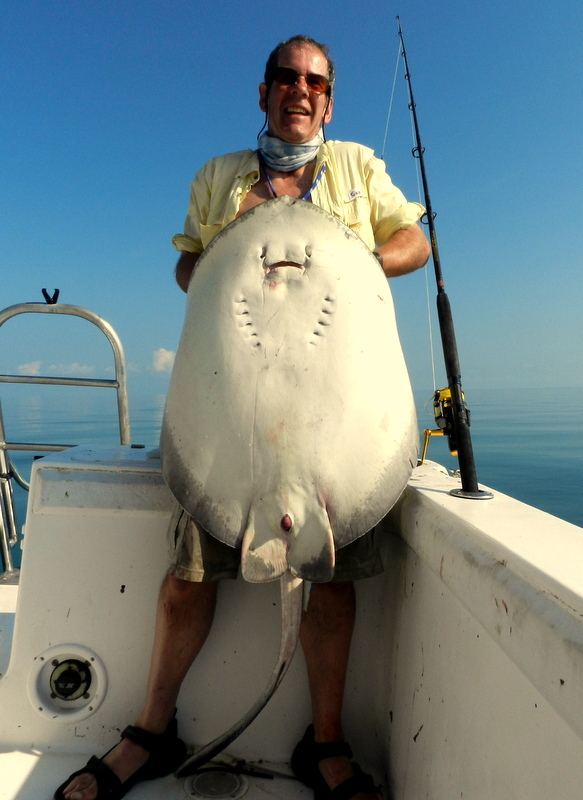 Well what a few days we are having I cant think back to when a guy on a fishing holiday in the Florida Keys has been ticking so many boxes and so fast hardly leaving and to come back for but I think Bob will be back. 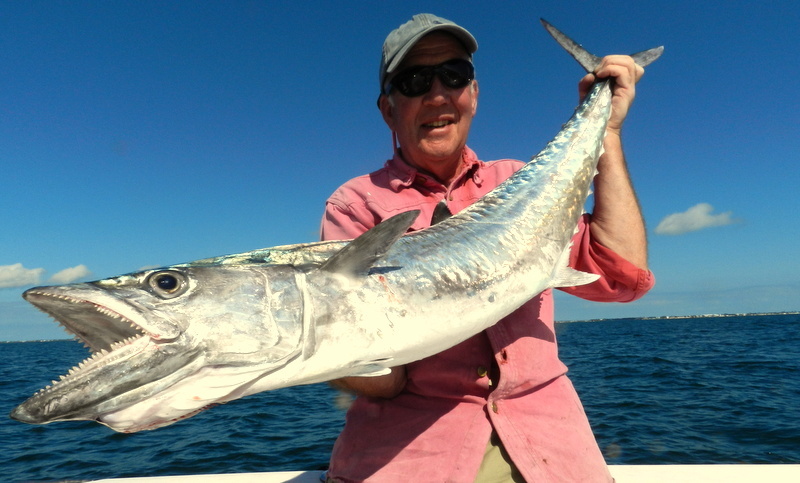 Two days ago after hearing reports of good king mackerel on the ocean we headed south and were having fun on the reef edge when Martin had a good cuda but we were only there for bait but I always leave a long rod out always a good idea. So bait done and into some near 200 ft and in no time fish on and there is only one fish that has to start with a power 100 yd run yes Bob had his first king and in no time with his increasing skills boat side well done again. Last day Bob was asking about a nice medium shark and he still had to do cobia so off to a gulf wreck and skip ticked both boxes some guys are amazed at how I can do this but this is when the over 15 years experience pays off. 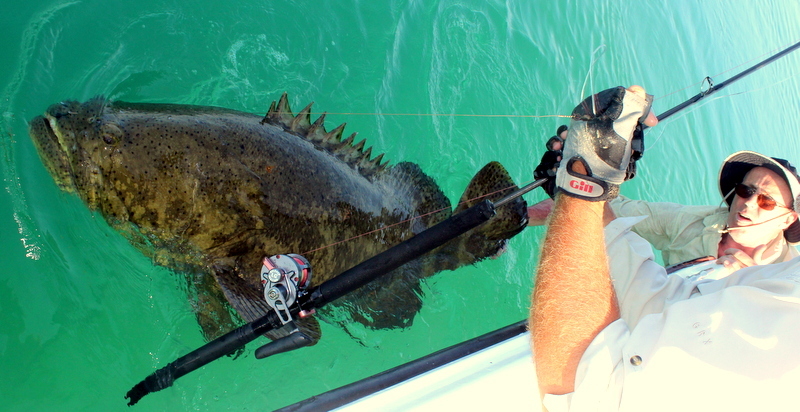 At last we have a video of a classic Whippy walk on goliath grouper thanks to Rodney Rigby and his Go Pro showing all the maddness of getting grouper right back to the boat when chumming a wreck. In all fairness when we get them this close very hard as you start the fight under the boat and as you can see in the video it takes more than one man you have to keep pressure on no pump and wind just drag and walk. But boy do those big 22/0 circle hooks work, the trick we have also found is also to use the size of bait to get the fish you want about a 1lb of bait to 100 lb of fish mad or what ! 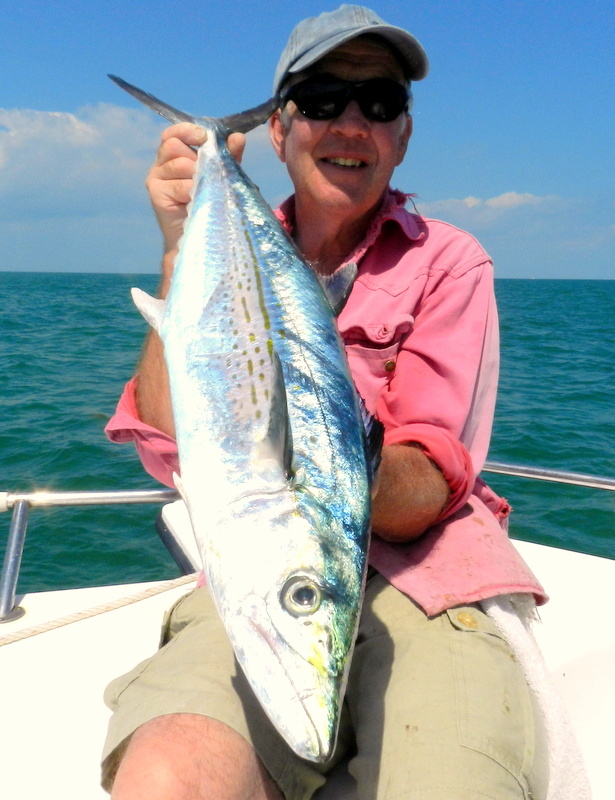 For this week we have a single newbie on our fishing holidays in the Florida Keys Robert Chambers has joined my oldest fishing friend Martin Arnold. 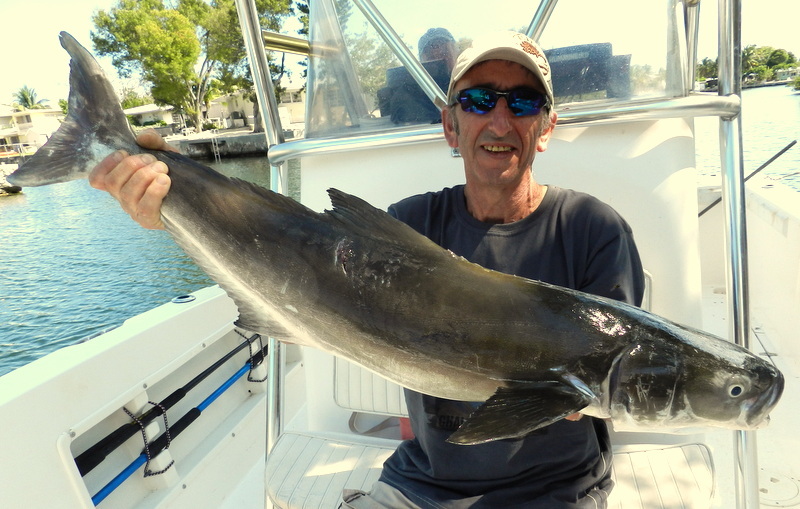 Bob had sent me an email that he had a few bad experiences of big game fishing and had been keeping up with this blog so if there was ever a chance for a single guy to fish, so he is here this week. I must say he has wanted to be very hands on and is learning very fast as he knows little it is often easier for me than a guy who thinks he knows it all but gets it very wrong. 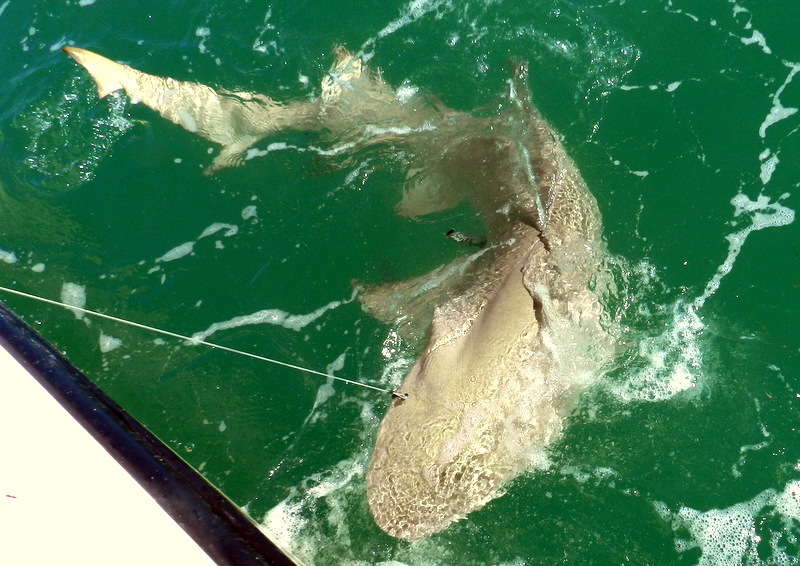 First three days very mixed weather but on day three we hit the gulf wrecks and ticked the fish over 100 lbs and the big shark boxes. 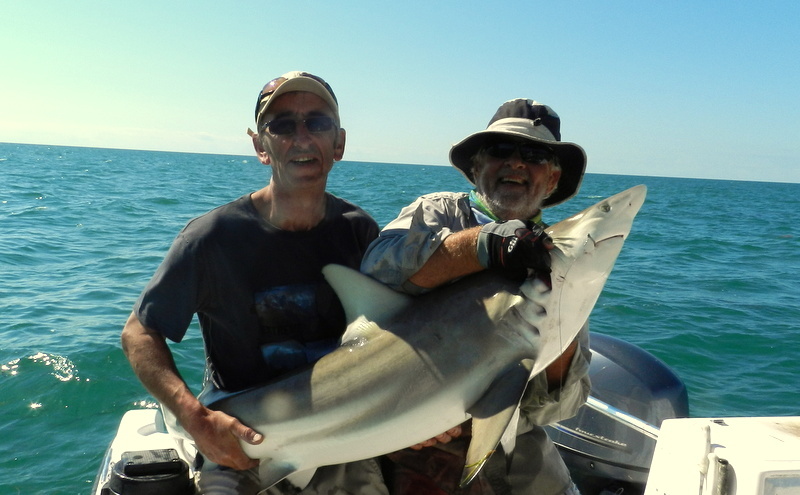 It always is nice to have guys like Bob who just like catching fish take day one winds over 20 mph so tuck into islands and fun with black nose shark on light 20 lb rods these fish just scream drag. 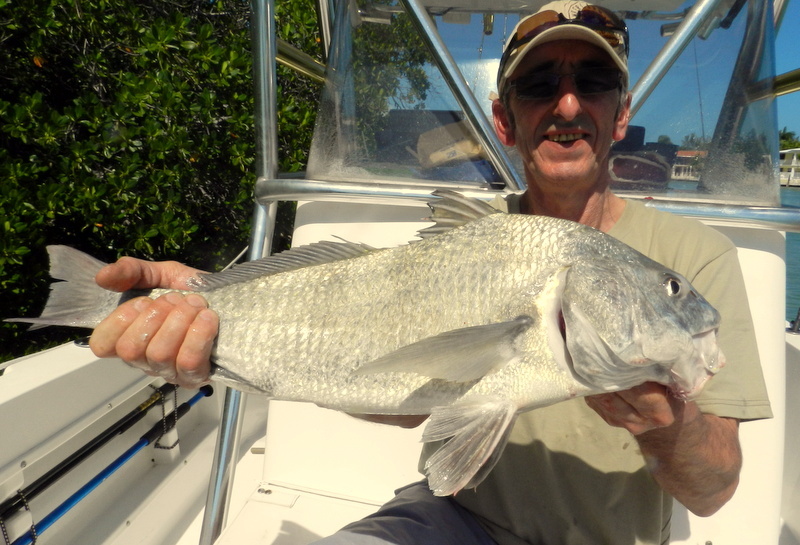 Then on day two fun in the mangroves and Bob ended up with a very good black drum this guys could get the Florida Keys fishing bug bad. 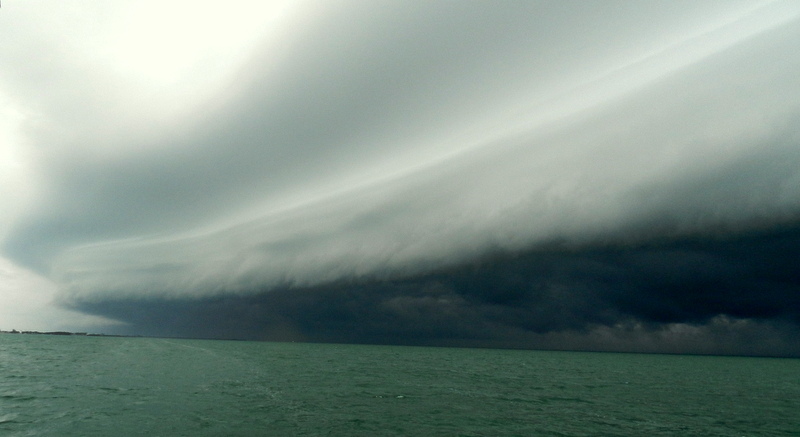 If you follow Henry Gilbeys blog ( and you should ) you will see he is into his ” God Beam ” photos and he has taken some very good ones well the other day we had the Florida Keys version. The ” Get the f*** out of here beams ” from no where this sucker just got worse so pedal as hard down as it would go over 35 mph and we just mad it home. We had been tracking this thing on the radar which is such a good tool to have on a boat so we were ok when it hit temps dropped 10 degrees and winds over 40 mph some times paradise kicks back. 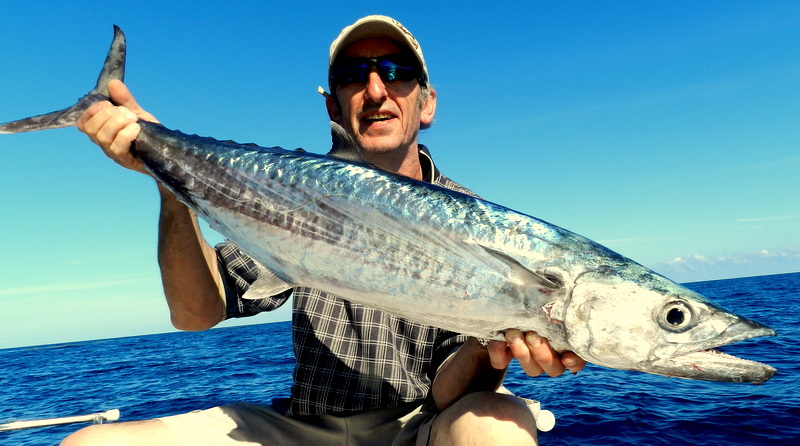 Massive king mackerel for Bob see next blog ! 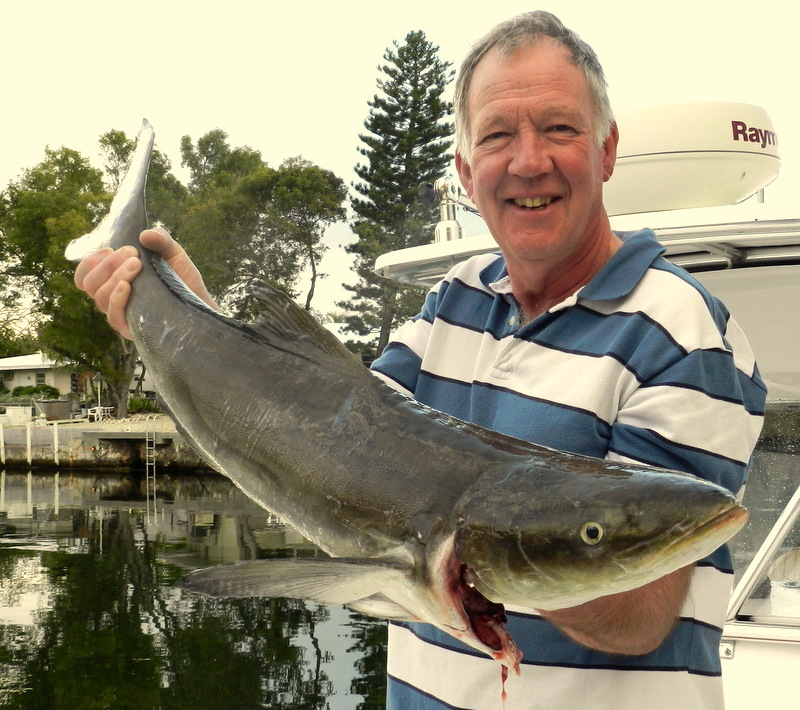 Well for two guys who at the start of their fishing holiday in the Florida Keys told me this time we dont think we will do big, in fact for the first few days they never had any shark rods on the boat, ended up with one of the best shark weeks ever. 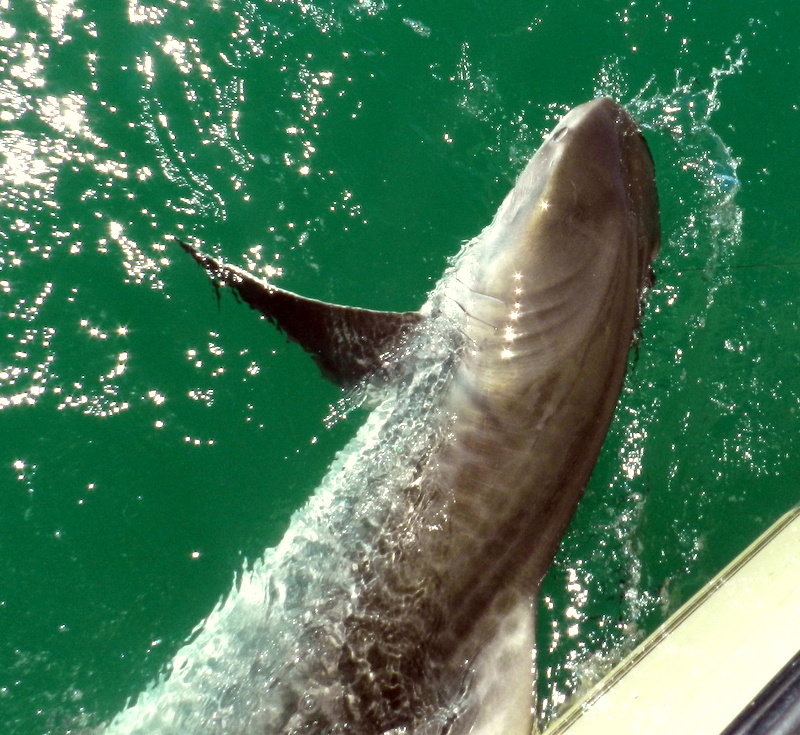 I am often asked what is my faveroite looking fish and I have to say the tiger shark is very near the top just a stunning fish and the other day on a wreck some 20 miles out in Florida Bay we had one. 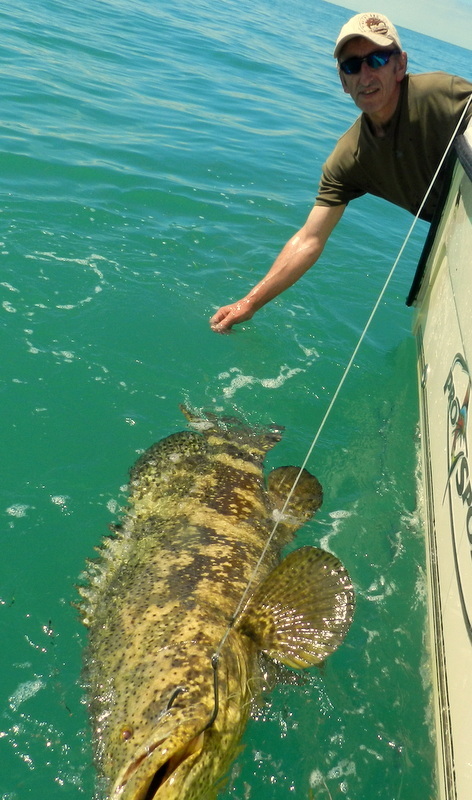 In just 12 ft of water sharks often visit these wrecks as they are a good food source and if you managed to get a bait past the grouper the wait is never to long. Often as was the case with this near 300 lb fish the fight is on the top and tigers have a very distinctive tail so when I shouted tiger Rodney not me the other Rodney went into Go Pro mode, a tiger under the water way to cool. Well all went well an other top class angling job and the fish was soon boat side video done and a very good one then the unpredictable side of shark fishing it went into unhappy mode. I do try and get all my shark hooks out but I am sorry not this one the wire was cut we only use small hooks and single strand wire so this fish will soon loose its new iron ware. I often have to tell my self caution first I have been sharking for nearly 20 years now and would like to do a few more. 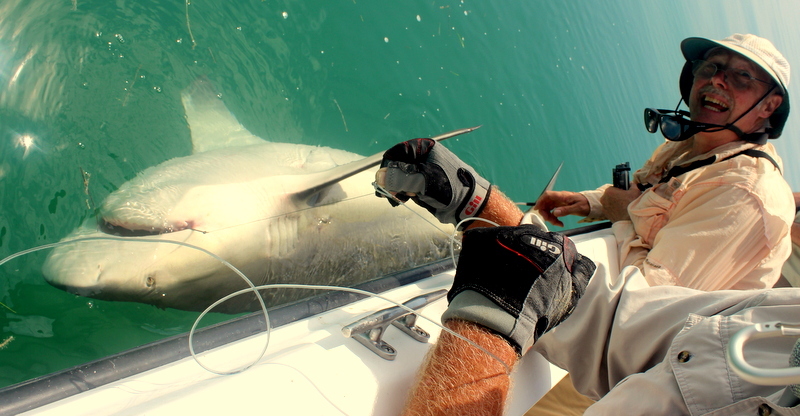 The shark lift I was shown for black tip sends them into some sort of trance the first time a skip said would you like it on your lap I was surprised but it does make one very cool screen saver. Well the other morning as they say a cunning plan was born over Helen’s Florida fry just love these planning meetings and this one nearly all came together. 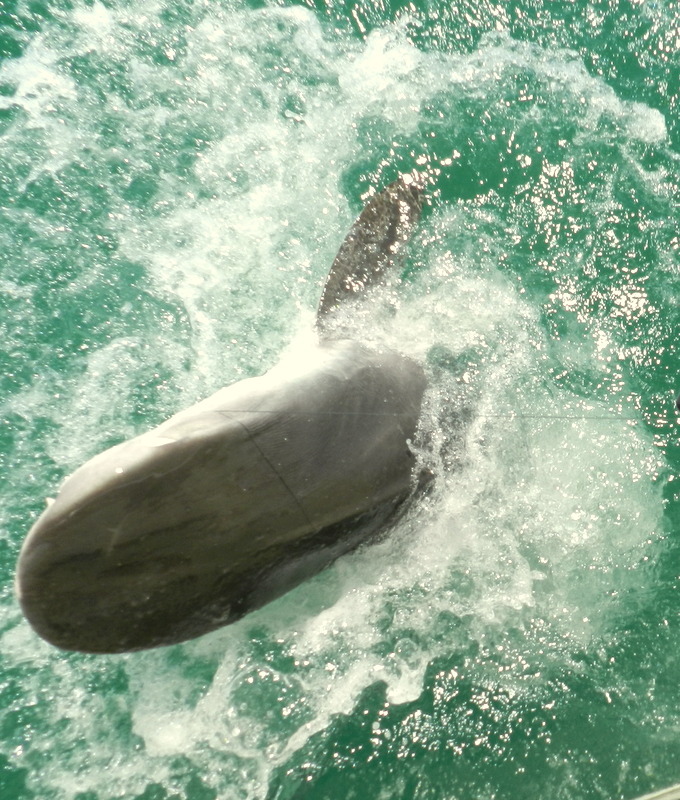 By the way the link on my home page at the top left to the underwater web cam at Bahia Honda is up and running again thanks to my web guy ( thanks John ) so you can all see just what is swimming under the bridge as well and yes also get annoyed with the tarpon as we are at the moment. Yes they are there but not sure why not feeding anyway the plan was to have a go in the dark then after breakfast at the state park, so cool can moor the boat right out side the cafe, back to the bridge tarpon again in the light with a back up plan jacks but this time we would have a shark rod. Well we got there in the dark and sure enough a few tarpon showing on the sounder but as before not a single take so moor up for some food then start plan B maybe the water is still to cold. Plan B stated very well this time a double jack for George and a fantastic gag grouper for Rodney such a shame out of season could just tasted those creamy white flakes but the guys who make are regs say they need this four month closed season and this is why the fishing in the Florida Keys is the best in the world. So with fresh bait put the boat between the bridges and shark bait out and in no time two very big bulls at back of boat and the cry I love, fish on, but this time soon the cry fish off it had gone straight through the main line but in a blur the skip had a new line out and again the cry fish on. So started a near one hour fight this was one big puppy but I have to say a well-behaved one and the fight was in open water never once did it try to run through a bridge. 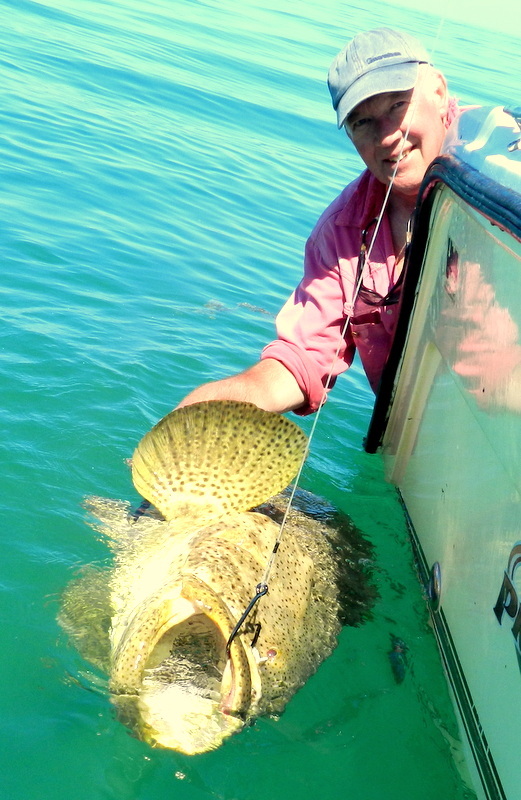 At the boatside my 100 lb dead lift could not even get the whole head out so this fantastic fish I would estimate very near 500 lb a fish off a lifetime and very well angled George. The other day we were watching the web cam at Bahai Honda and yes there were tarpon going through the bridge so post haste to the bait shop and load up with crabs and off we go. Well in less than an hour we were drifting down the camera channel and yes there were tarpon the water was so clear you could see them from the boat so put the pick down and rods out. Sorry to report then nothing not sure it was the cool night temps down 3 degrees or lack of run or the very clear water but Mr Tarpon and his mates were not having any of it. Then as the run picked up we watched a guy in a kayak in rough water have a battle with a good size jack ( why people do this I am still not sure but he was in the main shipping lane in 25 ft rough water ) so we went and got some pinfish and joined the party. 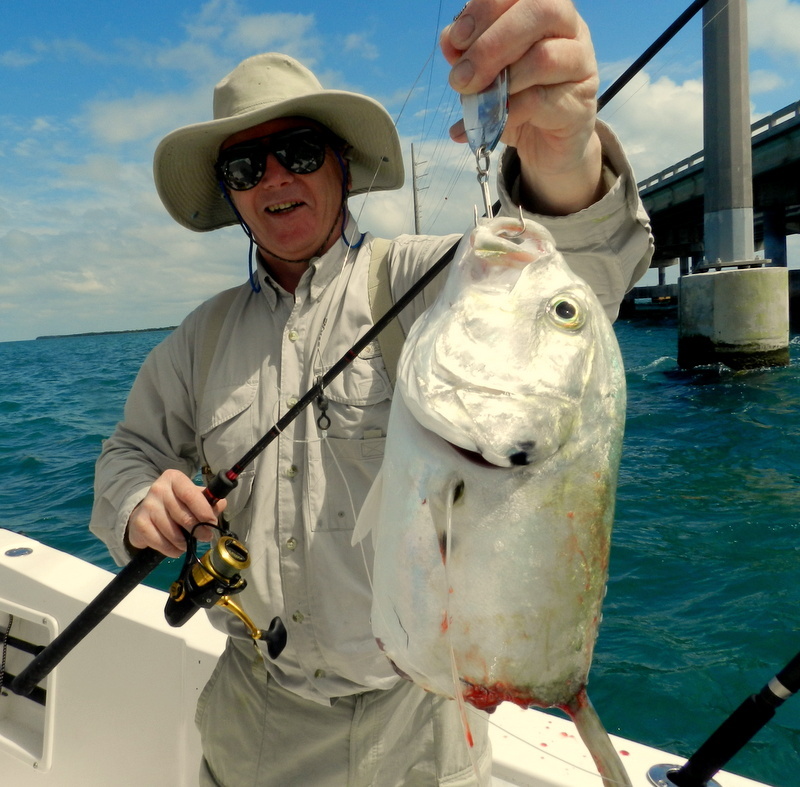 Jacks a plenty fun even on the tarpon rods in over 3 mph tide what a good game as Bruce would say then bang one of the bridges many bull shark nailed a jack by the boat so I see a plan coming. 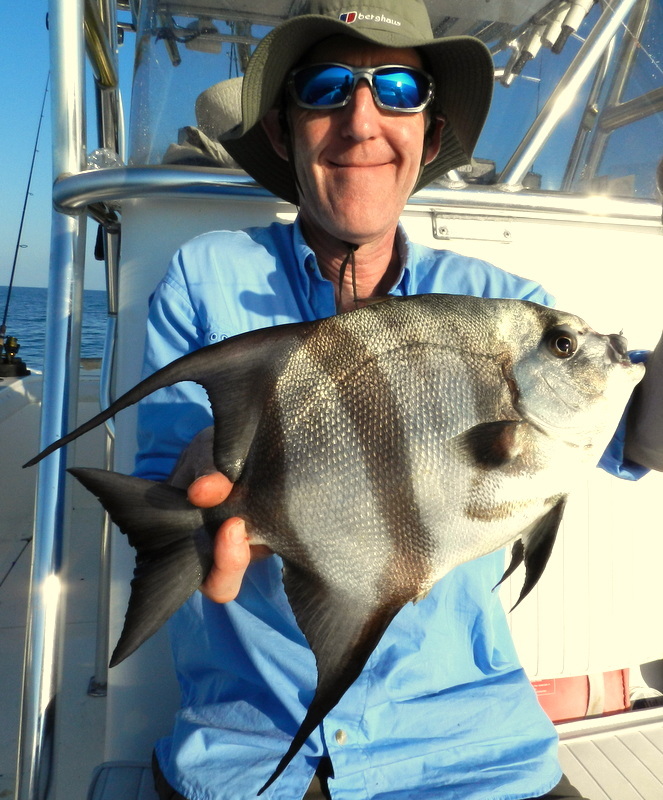 Had some fun the other day at anchor on the deeper ocean wrecks had a big shoal of spade fish on the surface in 115 ft of water they may not look much but on 10 lb line go nearly all the way down on the first run talk about schoolgirl giggles. 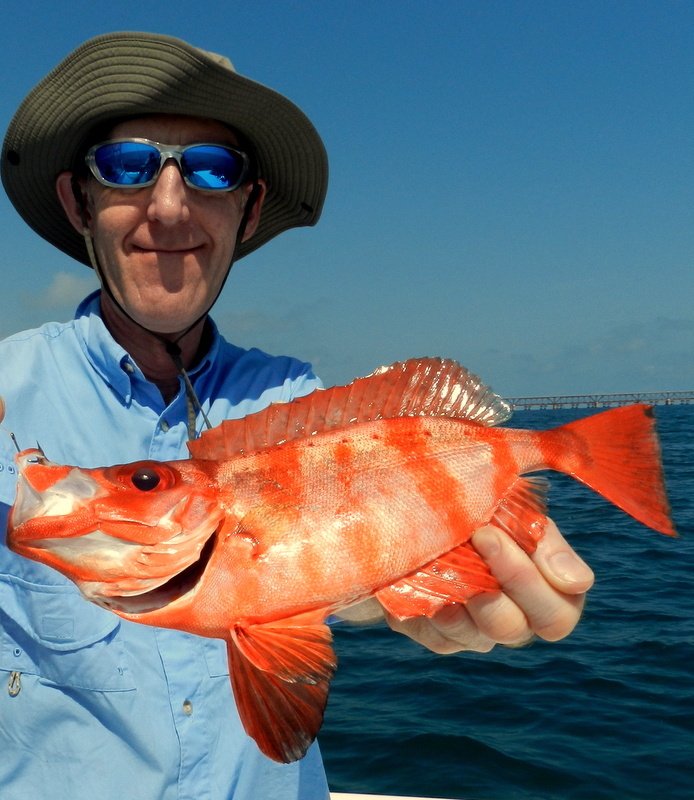 George also had one of the reddest fish you will ever see a Toro they dont do much but you need sunglasses to even look at them a very strange fish just one of the now 124 species to the boat in over 10 years of fishing holidays in the Florida keys. 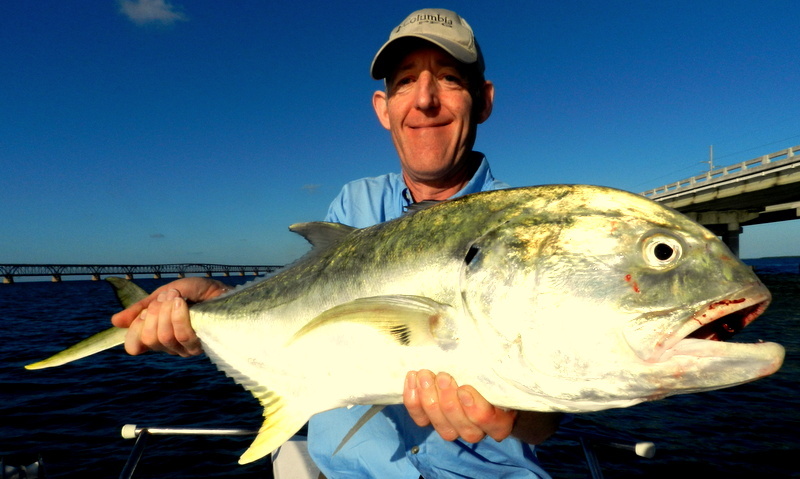 A very cool video to end with a good size and very good eating yellow jack in just 12 ft water on a ocean dive site ( there were no boats diving ) crystal clear water and you can see all his mates stayed with him right up to the boat.